JP wants to be an astronaut when he grows up. I’m using it to my advantage because I said it’s really difficult to become an astronaut–you have to work hard in school and have the best grades to reach that level. He actually put a lot of effort in on his schoolwork for at least a week or two for the motivation of becoming an astronaut alone. A week or two is better than nothing, right? Of course, for his sixth birthday, he wanted to have an astronaut party, and although I wasn’t as inspired by this one as I have been by others, I was happy to oblige. I’m always amazed by the variety of themes my kids have chosen. I haven’t had one repeat yet! I went pretty simple on the decorations this time, but it’s amazing what a little crepe paper will do to make everything look festive! 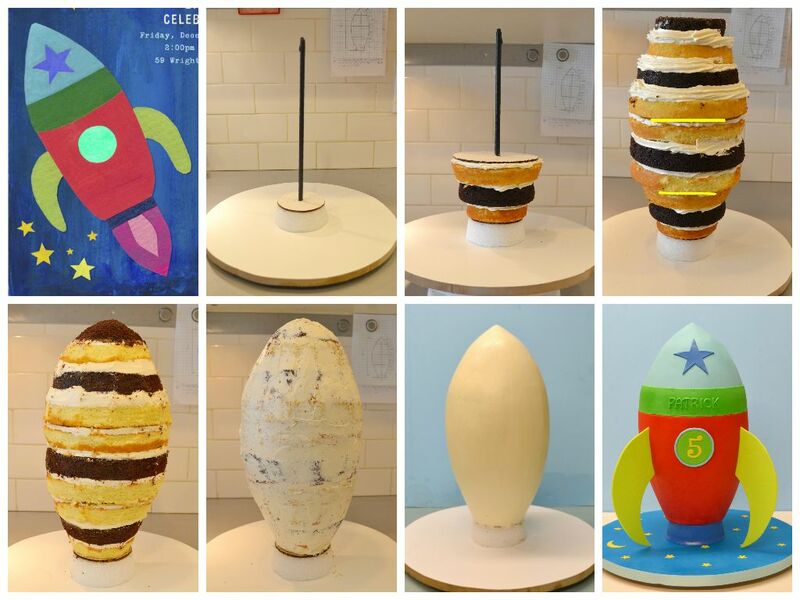 These rockets were pretty easy to make–rolled up paper, a circle made into a cone, little paper fins cut from a template I liked online, and tissue paper stuffed inside completed each one. They do look a bit like they’re on fire. If I had had more time, I might have put some smaller paper tubes inside with the fire coming out of them. I found the black paper at Hobby Lobby in the wrapping paper section, and it made for great night sky. I cut the stars out of silver, white, and light yellow paper with two star punchers. I ordered different sized paper lanterns corresponding with the different sized planets from a site online, but they weren’t going to make it in time, so I canceled the order and bought these from Walmart. I wished they weren’t all the same size, but they still gave the idea of planets, especially when I safety pinned a paper ring around Saturn and put some green paper land on Earth. My favorite decoration was the rocket made out of two large cardboard boxes stacked on top of each other and wrapped in silver wrapping paper. I took the smaller pieces of cardboard at the top of the highest one and folded and taped them into a pyramid shape, putting a cone of large paper on top to make it pointy. After cutting a door in the back, it made for a great photo booth! I also added a control panel for the kids to play with inside. When the kids walked in, we gave them a jet pack. I used the instructions here for the most part. The instructions were detailed and helpful. I added silver duct tape to make each more stable, didn’t bother with the words, used tissue paper instead of felt for the fire (the felt was much cuter, but I already had the tissue paper and didn’t want to bother with all the cutting), and added cute little stars. I also decided to just use a sturdy string instead of straps. It was a lot cheaper that way and still worked well! For our first game, we played musical planets, which is basically musical chairs, except that the kids had to sit on planets. It was actually safer than the chair game because no one fell like you do when a chair is pulled out from beneath you. I gave them their choice of a Milky Way or Moon Pie as a prize. Since I had older siblings there, some of them weren’t too interested in the game until they realized there would be a prize. After that, we headed outside for a moon rock hunt, using foil-covered Easter eggs with Starburst and Milky Way mini bars inside. Our yard is small and doesn’t have a lot of hiding places, so it was pretty stress-free for the kids to find the rocks. I guess they wouldn’t be too hidden on the moon, either, would they? Can you find them? The kids were pretty happy with what they found! It was 102 degrees and seriously humid outside, so we had to have a little water on us to cool ourselves down a bit. We had two buckets of water balloons that my son and selfless husband filled up for us. We then had a meteorite toss. The kids paired up and tried to see how many times they could toss them back and forth without dropping them. Our record was 126! After we did that for a while, we just threw them at each other, so you can bet those balloons disappeared fast. After that, we blasted off some rockets! I kept it simple, and we made Alka Seltzer photo canister rockets. You put an Alka Seltzer tablet in a photo canister, pour a bit of water, pop the top on, stand back, wait for the pressure to build up, and in a few seconds, the top will fly high. I did most of them for the kids, but a few wanted to do it themselves. After that, we were so hot from being in the heat of the day that we had to go inside for refreshments. I do not recommend making the cake that I made unless you are more professional than I am! It wasn’t sturdy enough with the small base and was difficult to get perfectly straight. By the end, it was tilting to the side, making me think it was going to take off like a real rocket! I did use skewers to keep it in place, and I put cardboard between every two layers to make it easier to serve, but it was still one of the most difficult cakes I’ve made. It was sixteen inches high with five layers plus two cupcakes at the top, and I used both chocolate and yellow cake recipes. Here’s the site I used to help me make it. When the kids left, they each received a small bag with Moon Pies, Milky Ways, and two glow sticks inside, as well as their jet packs. All in all, my newly turned six year old and his friends had a blast! This makes me wish I still had little kids who want to have themed birthday parties. So much fun!! I love making these parties! It’s a lot of fun for me, and of course the kids love it, too.